It’s an appealing idea: Eliminate the cells that support a tumor, and maybe the tumor will, in a manner of speaking, come tumbling down. But what if the tumor remains standing? Even worse, what if the tumor is soon accompanied by spreading metastasis? Such unexpected developments were in fact observed in a study conducted by researchers based at Massachusetts General Hospital (MGH). According to these researchers, the consequences of inducing the self-destruction of tumor-support cells crucially depend on timing. Tumor support cells, or cancer-associated fibroblasts (CAFs), may be engineered to carry so-called suicide genes. Because the genes can be activated by means of a small molecule inducer, they can be triggered at will. Such control is enormously convenient in cancer research. For example, it can enable researchers to eliminate CAFs at defined moments in tumor progression. Selectively orchestrating the death of CAFs from afar, the MGH researchers investigated whether targeting CAFs could limit the growth of breast cancer tumors implanted in mice. The MGH researchers bioengineered CAFs to carry a genetic “kill switch.” These cells were designed to die when exposed to a compound that was not toxic to the surrounding cells. The MGH team, which was led by Biju Parekkadan, Ph.D., chose two different stages of tumor growth in which the CAFs were killed off after the tumor was implanted. When the CAFs were eliminated on the third or fourth day, they found no major difference in tumor growth or risk of metastasis compared with the tumors where the CAFs remained. 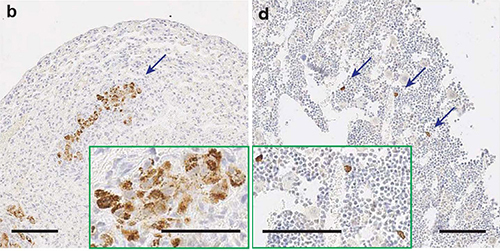 However, there was an increase in tumor-associated macrophages—cells that have been associated with metastasis—in this early stage. When the team waited to eliminate the CAFs until the 10th or 11th day, they discovered that in addition to the increase in macrophages, the cancer was more likely to spread to the lungs and bones of the mice. The unexpected results from this experiment could spur more research into the role of CAFs in cancer growth and metastasis. More research may reveal whether or not there is a scientific basis for targeting CAFs for destruction—and if so, the awareness that timing matters when it comes to the response of the tumor. While neither treatment affected the growth of the initial tumor, it is important to understand that most cancer deaths result from metastases to vital organs rather than from the direct effects of the primary tumor.